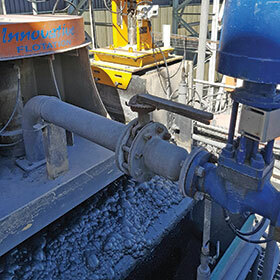 In order to improve the froth level control at a flotation concentrator in Rustenburg, eDART was recently commissioned to replace the froth level control valves on the secondary cleaner. Froth level control is extremely important on flotation machines as it directly relates to efficiency of the plant. If the froth level is too deep then the grade of the concentrate will increase and at the same time recovery drops off. When the froth level is too shallow the recovery will improve but a lot more concentrate will be produced at a lower grade. The aim is to produce concentrate at the optimum grade, which will result in the highest efficiency of the plant. From a control point of view, the most efficient point of a control loop is when the level is on setpoint and there is no error. Where error is recorded there is an opportunity to improve the control. The Rustenburg customer is using an advanced controller to control the froth level at the flotation plant. As flotation froth levels are influenced by more than one variable, a simple PID controller cannot offer the good control results required which more modern controllers do. A human operator will give the setpoint a step change and then leave it constant for a long period, and the signature of the more advanced controller is the gradual change to the setpoint point. As the advanced controller considers multiple variables in calculating the valve position, it can respond a lot quicker than a standard PID controller. If the output, or valve signal, represented by the blue line, is compared to the level signal (PV) represented by the red line, it can be seen that the ratio of the output signal to the process signal is approximately 2 to 1; this is the gain of the loop. With conventional PID controllers, the gain of the loop is seldom greater than 1. With the use of the advanced controller, the valve responds at least twice as fast to bring the level back to setpoint. This is one of the major advantages of advanced controllers over standard PID controllers, in that they are 100%–200% faster than the best a simple PID controller can achieve. If the gain on any control loop is too high, it will lead to instability of the control loop, as the level will overshoot/undershoot the setpoint. The final control element, or valve in this case, in any control loop is the limiting factor on how good the control can be. The valve has to be correctly sized. Looking at this trend it can be seen that the valve is approximately 45% open on average to maintain the control, which is evidence that the valve is correctly sized for the application. Any valve problems will result in a drop off in performance of the control loop. As the advanced controller is adjusting the setpoint continually, so the control valve is responding rapidly to keep this control loop in control. eDART has developed their range of slurry control valves to meet the exacting demands of modern advanced controllers, the end result being vastly improved plant performance for their customers.